Four suspected terrorists from Pakistan, who were supposedly sailing in a fishing boat in the direction of Gujarat in India, blew themselves up when intercepted by the Indian Coast Guard (ICG) on January 1, 2015 in the Arabian Sea, India’s defence ministry said in a statement on Friday. The ICG had warned the occupants of the boat – which was “carrying explosives” according to the defence ministry statement – to stop for inspecting its cargo. However, the crew increased the boat’s speed and tried to escape away from the Indian side of maritime boundary, after which the ICG ship chased the boat and intercepted it at 365 km West-South West of Porbandar, Gujarat, the statement added. “The hot pursuit continued for nearly one hour and the Coast Guard ship managed to stop the fishing boat after firing warning shots. Four persons were seen on the boat who disregarded all warnings by the Coast Guard ship to stop and cooperate with investigation. 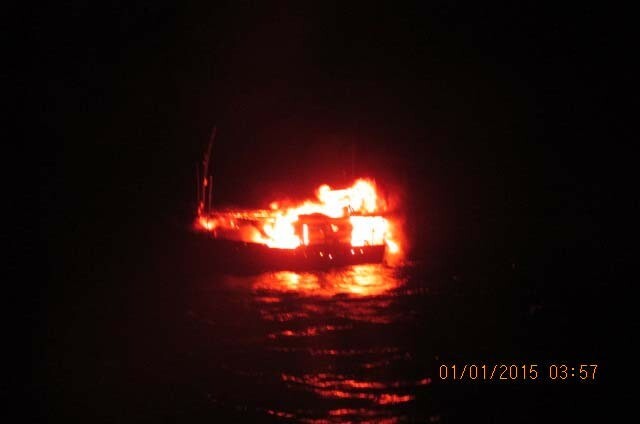 Soon thereafter, the crew hid themselves in below deck compartment and set the boat on fire, which resulted in explosion and major fire on the boat,” the statement noted. The boat is believed to have sailed from Karachi in Pakistan. “As per the intelligence inputs received on 31st December, a fishing boat from Keti Bunder near Karachi was planning some illicit transaction in the Arabian Sea. Based on the input, Coast Guard Dornier aircraft undertook sea-air coordinated search and located the suspect fishing boat,” it added. According to the defence ministry statement, the coast guards could not save the boat’s crew nor recover the boat, owing to “darkness, bad weather and strong winds”. “Coast Guard ships and aircraft are continuing operations in area to search for any possible survivor,” it added. While the defence ministry statement stopped short of mentioning any terror angle, media reports suggest that a possible terror attack has been averted thanks to the timely intervention of the ICG. Following the incident, security agencies have stepped up vigilance across the coast. The Gujarat Police is already on high alert in view of two high-profile events – ‘Pravasi Bharatiya Divas’ and ‘Vibrant Gujarat Global Investors Summit’ – happening in the coming weeks.